Fish ‘n Chips – Namaste! Fish ‘n Chips (no not French Fries but Potato Chips) done Indian style. I don’t think I’d go with the garlic bread, a bit much that might be, but his version of the fish looks great. All except for the part where he takes a sip of the beer and then pours the rest into the batter bowl! What??? How can he do that? I was laughing so hard when he did that, but anyway, I like his recipe, and thought I’d share it with you. That is, if any of you health-conscious people are ever in the mood to make a good fish ‘n chips dinner. I do it about once a year, but I’ve never perfected the batter recipe yet. I can now make good “chips” or French fries, using a batter I found online and then baking the fries, coated in the batter, on a cookie sheet in the oven for 15 minutes on one side, flipping them over, and 15 minutes on the other. I’ve done that a couple of times now and wow, they were fabulous. The only hitch is that I can’t remember where I got that recipe for the batter!!! (You will see I have remembered it so click above for the recipe). And I didn’t print it out or save it. I made it right off my laptop in the kitchen. Darn. But it wasn’t hard, and there was no beer involved. Just flour, herbs and spices, the usual batter, oh and some olive oil and water, as well. It’s quite a liquid-y batter. Now I want some authentic British fish ‘n chips. I wish I could call someone up in England and they would fly me over a couple of orders. There is nothing in this whole world as good as authentic fish ‘n chips. Nothing. 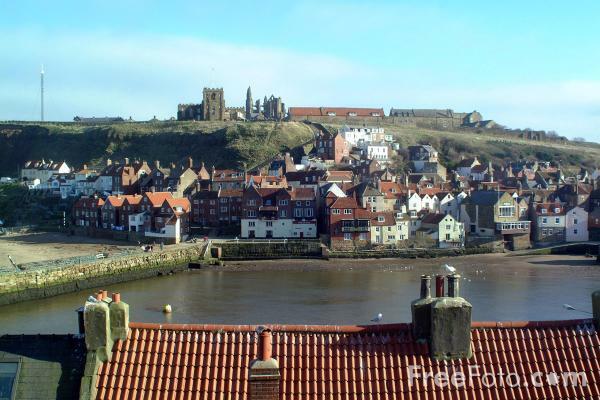 Especially when the fish is caught locally – like in Whitby! 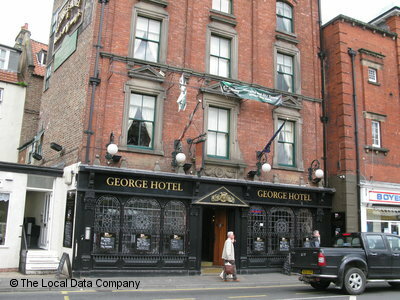 We had the best fish and chips EVER with our friend Don Burluraux at The George in Whitby one year. Wow. Oh my. My memories are going to have to sustain me. 5 Responses to Fish ‘n Chips – Namaste! Fun and enticing! I’ve never had fish and chips, but battered shrimp is a favorite. Anna, ? batter on the chips? [Note: I re-read my entry and I did say that I use a batter to make oven-baked F.Fries – so Anna, yes I did say that, and they came out fabulous! I got the idea from some store-bought frozen Fries(chips) by Ore-Ida I think that are “crispy spicy fried”, and those were pretty good, but mine were even better.] I FOUND IT AND THE RECIPE IS HERE FOR CRISPY SPICY FRENCH FRIES (OR “chips” in the UK). Anyway, I also missed him not being able to open the beer, for the same reason, TT. I’ll have to run that video again. Having had to type medical transcription for many Indian doctors, I have no trouble understanding them. He just cracked me up the whole way through, and then when he was eating everything, he was enjoying it all so much! I needed a good laugh today. LOL! What made me laugh was when he tried to open the beer bottle and they had to cut away to the next shot because apparently he didn’t know how to do it! Wow, I’ve had numerous Indian friends but I still had a hard time understanding his accent at times.